A Fine Balance provides specialized therapeutic massage and bodywork in Mount Shasta, California. 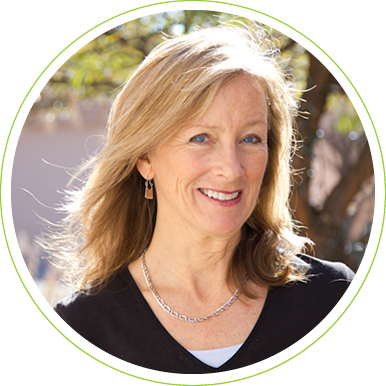 Board certified massage therapist Karin Sandberg tailors treatments to your goals, whether you are coping with injury or illness, looking to stay healthy, or simply seeking relaxation and rejuvenation. My passion in life is finding balance. Therapeutic massage allows me to express and live my passion because it embodies physical, mental, and spiritual principles of balance and movement, while providing me with opportunities to meet new people, solve problems, help people, teach, and learn. I am a board-certified massage therapist, having graduated from a 1000-hour therapeutic massage program in Arizona in 2008. I have a solid foundation in Swedish and deep-tissue massage, including trigger-point, myofascial, and neuromuscular release techniques, reflexology, prenatal massage, sports massage, and stretching techniques. Since graduating, I have been certified as a Reiki Master, and I have completed courses in oncology massage, pediatric massage, orthopedic massage, hot stone massage, craniosacral therapy, and Compassion Cultivation Training. The range of my massage experience includes high-end spa environments, private practice, teaching, and volunteering with the medically frail. My approach to treatments is to blend techniques in a way that works for you. My goal is to help you restore balance to your body so that you can find balance in your life. Treatments – What’s Your Goal? The long, smooth, flowing strokes of Swedish massage are what lead you into deep relaxation. This massage treatment combines the relaxing properties of deep heat, aromatherapy and Swedish massage. 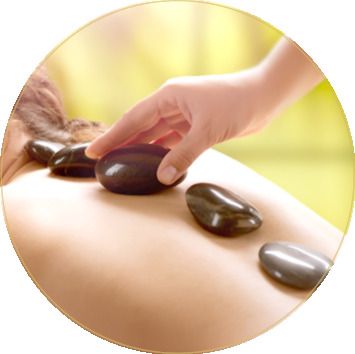 Heated stones are placed at key points of the body and are used for massage to tight or tired muscles. These treatments start with exfoliation—a sugar scrub or dry brush treatment—followed by an application of deep moisture. You are then wrapped in warmth to allow the healing properties to be absorbed through your skin. While wrapped, you will experience deep relaxation as your scalp and face are gently massaged. Massage alleviates discomforts that occur during pregnancy. Special positioning is used to ensure you have a relaxing and pleasant treatment. Trigger point, neuromuscular and myofascial release techniques are combined with stretching to address deep-tissue distress. Massage helps you achieve optimal sports performance. It can help you prepare for, and recover from, competition. Different techniques are used to meet your athletic goals. Assessment is the first step in developing a series of massage treatments aimed at restoring movement and alleviating chronic pain. Reiki is a gentle energetic bodywork that focuses on freeing the energy flow throughout your body, Clients remain clothed during a Reiki treatment. Using very light holds applied to the skull, spine and sacrum, the treatment affects the central nervous system. This is effective for treatment of migraines, TMJ, ear problems and for children with attention or sensitivity disorders. Reflex points on the feet, hands, and ears are linked to every part of the body. Working these points can bring profound relaxation and relief to the whole body. Available in 15/30 or 60 minute sessions. Individualized treatments focus on providing comfort and support to help you manage the effects of cancer treatments. In-home treatments available by request. Massage benefits children who have: experienced trauma (even a difficult birth); pain from injury or medical treatment; difficulties in school; stress or strenuous activities. Parents remain with children during the treatment; children remain clothed; children dictate the length of their treatment. Very light, compassionate touch is used to bring comfort to those suffering from long-term or debilitating illness. In-home treatments available by request. The Therabath warm wax treatment moisturizes, and provides heat therapy for relief from arthritis. This is a wonderful treat for hardworking hands any time of year! Choose from a mint or lavender exfoliating scrub, which is then followed by an application of shea butter balm to provide deep moisturizing. Plan to spend about 15 minutes reviewing your health history prior to your first treatment. Please be ready to provide information about any medications, surgeries, injuries or conditions. To save time, download, complete, and bring this form to your first session. The therapist will leave the room allowing you to undress to your level of comfort and get under the sheets according to the therapist’s instructions. It is best if the therapist can access your tissues directly, rather than over any clothing. At the end of the massage the therapist will leave the room allowing you to dress privately. Proper and professional draping techniques are used to maintain client modesty at all times. Jewelry should be removed for the massage. Communication between client and therapist is the key to a successful and comfortable treatment. Never hesitate to tell the therapist if you would like something modified to improve your experience. 24-hour notice is required for cancellations. If you must cancel on short-notice and want to avoid paying a cancellation fee in the amount of the massage, send a friend or relative in your place. Payment is due at time of service and can be made via credit card, cash or check. A Fine Balance reserves the right to refuse service to anyone. Massage will not be performed on anyone who is intoxicated or heavily medicated. If you have any contagious illness or skin condition. Therapeutic massage benefits your body, mind and spirit. Consider getting regular massage treatments an important part of your health routine. Massage can enhance your health and appearance, support your sport, alleviate common ailments, and relieve stress. Read more about how massage helps you stay healthy and happy. Massage benefits you by increasing dopamine and serotonin levels (associated with increased relaxation/decreased pain), while decreasing levels of the stress hormones epinephrine, norepinephrine, and cortisol (this stress hormone inhibits immunity and is also associated with weight gain). The relaxation effects of massage work to decrease stress levels, which in turn help to improve sleep patterns and reduce fatigue; decrease feelings of anger; improve mood and self-esteem; increase mental alertness and work or academic performance. Increased circulation during massage serves to bring fresh blood and oxygen to painful and constricted muscles. Massage stimulates the release of endorphins and other pain-reducing neurochemicals. Local circulation during massage increases up to 3 times more than circulation at rest, aiding the delivery of nutrients and oxygen to cells and tissues, and aiding the removal of metabolic wastes (helps dilute poisons we put into our bodies!). The heart rate is reduced through the relaxation response. Blood pressure decreases due to blood vessel dilation. This effect can last up to 40 minutes after massage. As circulation increases, more nutrients are made available to the skin, helping improve its condition, texture, tone, and appearance. The number of, and function of lymphocytes and other white blood cells is increased by massage, which helps you resist or fight infection/illness. Massage promotes the circulation of lymph, which can help reduce swelling (edema). Massage stimulates the digestive and urinary system, assisting the removal of waste in the body’s systems. Massage stretches, broadens, and lengthens muscles, which increases flexibility, and joint range of motion. A tired muscle recuperates 20% after 5 minutes of rest; it recuperates 100% after 5 minutes of massage. This is because massage increases blood circulation, bringing fresh oxygen and nutrients to muscles. Use this form to request your appointment, or call 530-918-3640 directly. Be sure to include your phone number and any comments regarding your condition and desired treatment. First visit? Plan to arrive 15 minutes early or complete the intake form prior to arrival.